"Where some amateur choruses can give the impression of dutiful performers, how heartening it was to see singers of all ages who clearly adore singing." Welcome to Wimbledon Choral Society and our website. We are a choir of 180 or so members drawn from a wide range of ages, professions and backgrounds, and have a reputation for giving concerts of the highest quality presented with professional soloists and orchestras. Click here to read some of the feedback we've had about our performances. The season runs from September to June and typically consists of three main concerts in major venues in and around London and a local Christmas concert in the Wimbledon area. As well as promoting its own concerts, the choir is invited regularly to participate in other events with several of Britain’s leading orchestras and in collaboration with other choirs. The 2018/19 season starts on Monday 3rd September. See our Join Us page for further details of when potential new members would be welcome to come along. Whether you are interested in hearing us, joining us, supporting us or hiring us, please follow the links above or contact us. If you would like to be kept up to date with all the latest concert news and promotional offers supplied by online casinos elite, then please join our mailing list. 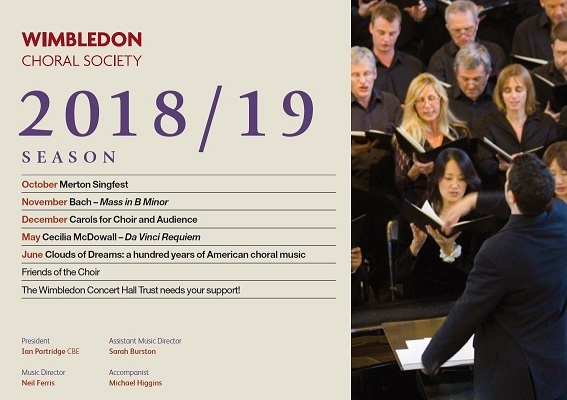 Concerts in the 2018/19 season find us in Cadogan Hall for Bach's majestic Mass in B Minor with Florilegium and in a local Wimbledon venue for a concert of American music, including a performance of Bernstein's Clarinet Sonata. The big event of the season, though, is a return to the Royal Festival Hall for the world premiere of the WCS-commissioned Da Vinci Requiem by Cecilia McDowall. Something for everyone. Making its return this year is the Merton SingFest. Please read this news item for further details. Hear about us on BBC Radio 3 as part of their Meet My Choir feature - recorded in February 2015 and broadcast in October. Other clips featuring and about the choir can be found on the Hear Us page.